We kicked off the opening of the "Free Wall" by having a spray paint workshop led by local mural artist Dan Toro. It was a big hit and it got the wall started off right. The wall is open to all- you can just show up and paint. Please only use spray paint or latex wall paint. It is meant to be a practice wall of sorts for artists (or anyone- you don't have to consider yourself an "artist" to use it) to practice on and try out small murals. Just keep it clean- guidelines are posted and feel free to post your work and use #laramiefreewall. The address of the wall is 327 E Kearney St, but it is actually the parking garage for that building in the alley, and faces 3rd St and Enterprise Car Rental parking lot. Go paint! Artist Dan Toro leads a spray paint workshop this spring to get the wall started off. Dan Toro and Adam Skedsen won the call for the Downtown Laramie Mural Project 2018 Murals. Toro will be painting the pocket alley and community garden area and Skedsen will paint a mural on 2nd St next to Plains Tire. Thanks to the selection committee for their time and attention to detail throughout the process! Stay tuned for the dates for a mural dedication party at the the end of summer when they both are finished! And int he meantime stop by the alley to see the great community garden the Downtown Clinic is working on- all are welcome! This past April the artists came to Laramie and held a community story gathering and storytelling even. 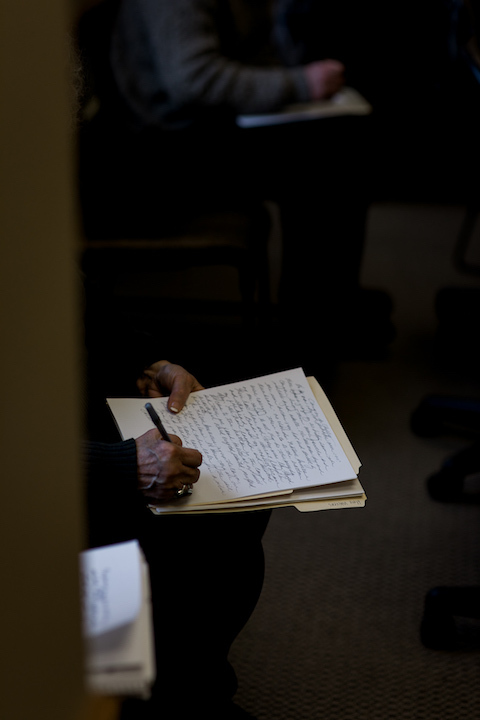 The artists gathered over 150 stories by leading participants through cognitive memory exercise. Then actors Anne Mason and Peter Parolin read some selected stories aloud at the community event. In general the artists, Charles Blanc and Tristan Surtees, have been blown away by the engaged and positive nature of our community, and the appetite of the community to participate in a mysterious, process oriented project like this. For everyone involved it felt like a truly collaborative and magical week. More will come of this so stay tuned! Sans façon: Our favorite artist group is coming back to town! 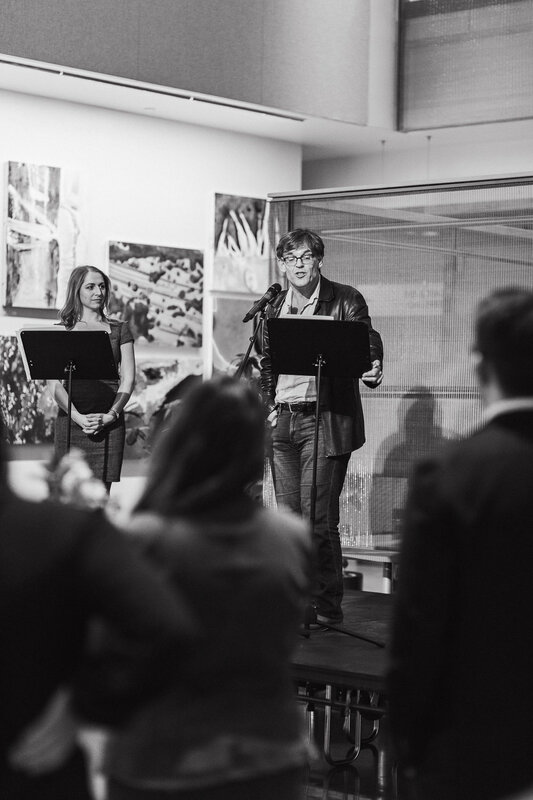 Join us for a community storytelling event Thursday April 26, 7pm, with the visiting artists Charles Blanc and Tristan Surtees. This is their third visit to Laramie in their ongoing community project here. Their work is always fun and interesting... hope to see you there! 2018 5 x5 Public Art Slideshow was a hit! Join us at our annual 5 x 5 public art slide show at O’Dwyers Public House, 1622 Grand Avenue, on Tuesday April 3rd from 5:30 pm - 7:30 pm! 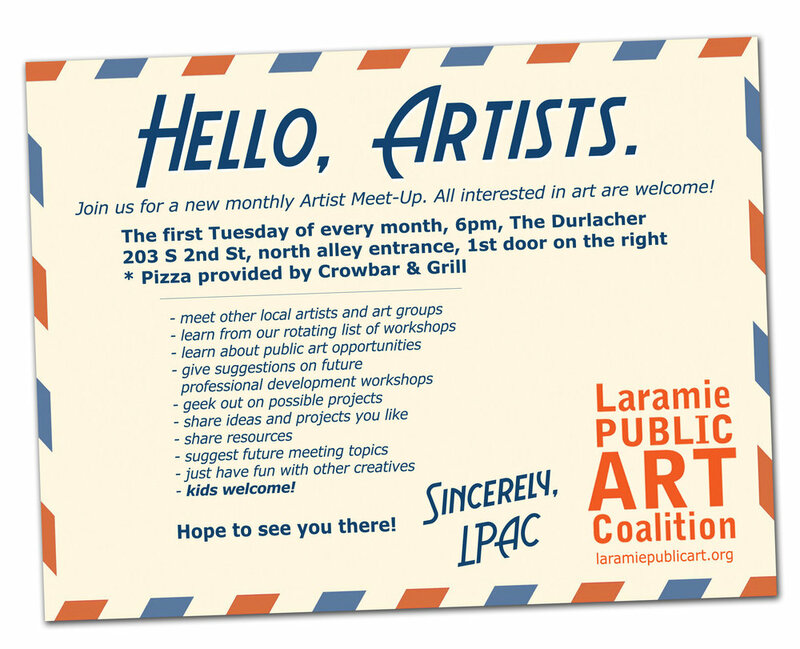 The first Tuesday of every month the Laramie Public Art Coalition is hosting a monthly artist meet up. All artists and those interested in art are welcome. Come meet other local artists and art groups, learn about public art opportunities, give suggestions on future professional development workshops, geek out on possible projects, share ideas and projects you like, suggest future meeting topics, have fun with other creative types. Next meeting is LPAC's 5 in 5: Tuesday April 3, 5:30 pm, O'Dwyers Public House. Our regular meeting space is The Durlacher, 203 S 2nd St, north alley entrance, 1sr door on the right. RFQ: Coffey Engineering is holding a call to hire an art/artist team to create a public art piece in the Right of Way strip north of their building at 902 S 3rd St, Laramie, WY. Link to the full call details. Mural projection with mural artists, Cooper Center staff and students at Cooper Center for the Creative Arts. LPAC and local mural artists team up to help the Cooper Center for the Creative Arts do their first mural. The summer classes at the Cooper Center for the Creative Arts are working on the center's first ever mural. It can be intimidating to do such a large project, so LPAC and local mural artists offered to help with some technical parts such as the nighttime projection. The staff and students will be working diligently this summer on the mural. Stop by and see their progress! Charles Blanc and Tristan Surtees make up the award-winning artist team known as Sans façon. The sentiment of Sans façon—which, loosely translated, means “without unnecessary fuss or ceremony,”—guides their practice, which responds to the complex relationships between people and place. See their website. 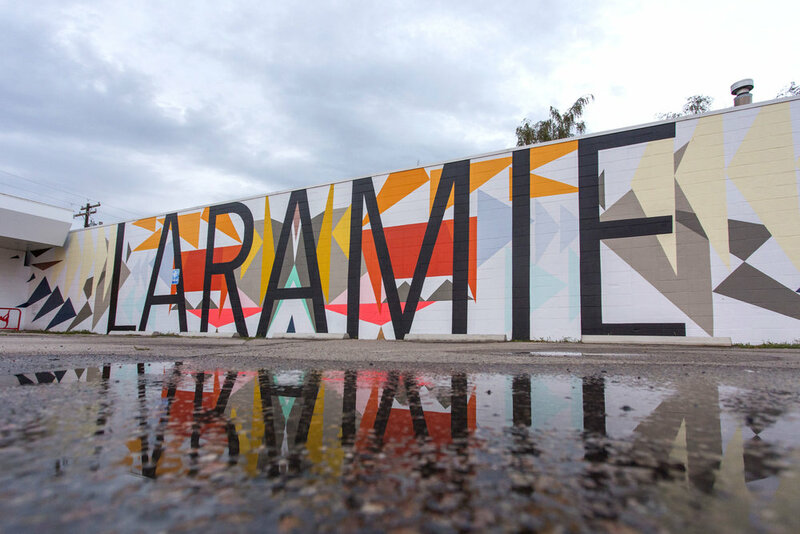 Our vision for this project, with our partners, is to bring together the Laramie communities through public art practice, fostering inclusivity and dynamic cultural engagement opportunities. 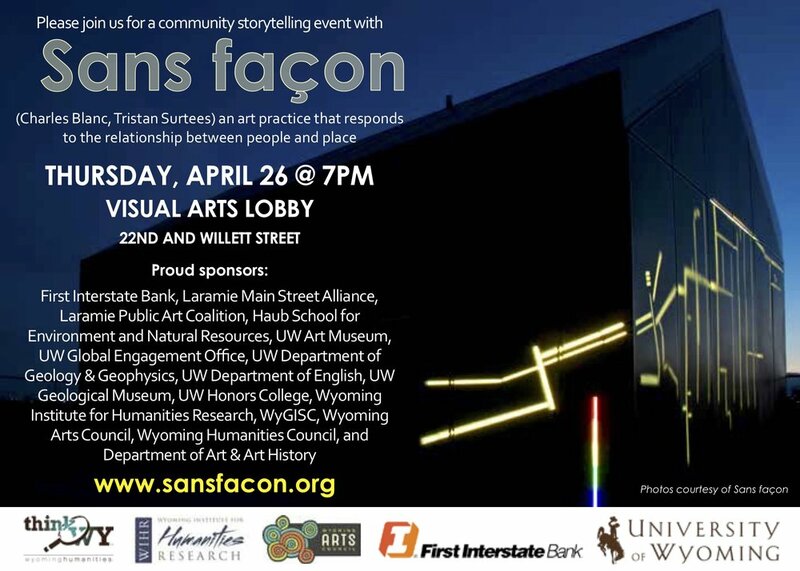 Through a multi-year collaboration with artist group Sans façon (Tristan Surtees and Charles Blanc), we hope to develop and implement a public art project in Laramie that responds to the relationship between people and place. Unique to this art project and collaboration will be a focus on addressing the binary between “town and gown” in order to foster a greater sense of connectedness and shared identity. Most recently, in March 2017, the collaborative steering committee comprised of UW Department of Art and Art History, Haub School of Environment and Natural Resources, UW Art Museum, UW Honors Program, UW Department of English, UW International Programs, UW President’s Committee on Public Art, Laramie Main Street Alliance, Laramie Public Art Coalition, Wyoming Art Party and Wyoming Institute for Humanities Research, organized for Surtees and Blanc to visit Laramie to investigate the realities of a long-term project and give their second public presentation in Laramie. See video of that presentation here. The working group is busy applying for grants and raising funds to ensure this project can happen. Let us know if you want to donate or get involved! We obviously love Laramie and know how great it is here, but we feel honored and fortunate to have such a well respected international artist team recognize that as well and be inspired to do a project here with us. Fingers crossed we get enough funding to bring them back here this fall to continue! Project Update: Artist Favian Hernandez won this call. The Laramie Mural Project, in conjunction with the Albany County Public Library would like to invite artist living in Albany County to submit request for qualification (RFQ) for an indoor mural/public art installation at the library. Download the announcement here. Responses are due January 13, 2017 by 4 pm MT on a jump drive to Caitlin White, Executive Director, Albany County Public Library Foundation, 310 S. 8th Street, Laramie, WY 82070. During the summer of 2016, LPAC was thrilled to part of “Love Motel for Insects: Laramie Railroad Depot Variation and Pollinator Garden” by artist and biologist Brandon Ballengée. This project involved a temporary public art installation at the site of the Laramie Depot in Laramie’s historic downtown. “Love Motel for Insects: Laramie Railroad Depot Variation and Pollinator Garden” became the location for a series of public programs with the artist and was part of the exhibition, “WASTE LAND: A Survey of Works by Brandon Ballengée, 1996-2016,” at the University of Wyoming Art Museum. “Love Motel for Insects” is an ongoing series of international public art installations that Ballengée has created over the last 10 years to provide situations between humans and arthropods. The works use ultraviolet lights on enormous sculpted canvases to attract insects and create an opportunity for public interactions with nocturnal arthropods, which are not often seen. The pollinator garden is a permanent perennial bed planned by a consortium of organizations that includes the Laramie Depot Board, Laramie Garden Club, Laramie Main Street Alliance, Laramie Parks and Recreation, Laramie Public Art Coalition, Union Pacific Railroad, UW Art Museum and UW Biodiversity Institute. Volunteers planted the garden along the length of the train at Depot Park. Children and adult participants learned which plants attract bees, butterflies and hummingbirds, participated in hands-on activities and displays by partnering organizations, and created artwork during a Bug Boot Camp for kids. The pollinator garden was coordinated by the Laramie Garden Club, UW Art Museum and UW Biodiversity Institute. Partners for the Pollinator Week Festival include Albany County Master Gardeners, High Plains Seed Library, Laramie Garden Club, beekeeper Jesse Taylor, U.S. Forest Service, UW Art Museum and UW Biodiversity Institute. The “Love Motel for Insects: Laramie Railroad Depot Variation and Pollinator Garden” is funded, in part, by the Laramie Beautification Committee, Laramie Parks and Recreation, Laramie River Conservation District, Union Wireless, UW Art Museum Gala funds, UW Biodiversity Institute and Wyoming Public Media. Artists located within Albany County are welcome to join us as we continue to paint murals that are reflective of Laramie's unique cultural assets. We meet in the Laramie Main Street office at 207 Grand Avenue. Email downtownlaramie@gmail.com to be added to the meeting notification list or visit the Laramie Mural Project on Facebook. The Laramie Beautification Committee (LBC), through a call process, commissioned Laramie artist Stan Dolega to build a bold, 200’ long, artwork in the northwest quadrant of the I-80 and 3rd Street interchange. The installation titled Penumbra screens an industrial property to the west and creates a visually engaging area for those passing by. The project is located on private property and was 95% funded by private gifts. “The Laramie Beautification Committee has had its eye on this corridor for over a decade as an area that must be improved if we want to attract visitors and businesses to our community. The timing of finding a willing private landowner, funding, and having a public art vetting process in place through the new Laramie Public Art Plan, were a perfect combination for bringing this project to fruition”, said Beautification Committee chair Dan Furphy in October 2015.